As college students across the country settle into the new school year, the age-old question of how to keep in touch with them without hindering their independence continues to plague parents. To offer some tips on what to do -- and maybe more importantly, what not to do - The Early Show turns to the mother-daughter team of Marlin Potash and Laura Fruitman. 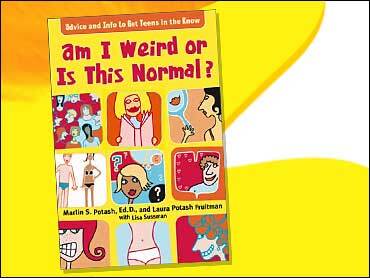 They are co-authors of the book, "Am I Weird Or Is This Normal?" Potash says, "It's about letting your child go - do what she's supposed to do at this stage of life. A college kid is supposed to learn to be independent and so parents have to really back off and allow their child to become an adult, which is hard." Asked how she grades her mom in terms of letting her grow up, Fruitman says Potash is pretty good and adds, "There are a few comments that are kind of annoying: 'Did you do your homework? Is your room clean?' – and all of that: Mom, I'm trying to live my own life." Fruitman says, "We're sort of unsure and going away and learning to become adults and a part of us think we're adults already and can handle life. But, at the same time, we're not there yet. We're in the process of learning and becoming the people we are going to be and we need help and our mommy and daddy to guide us with their wisdom. But, at the same time, not treat us like kids." Potash notes, "So parents need to take their cue from their children. If your child doesn't feel well and says I don't feel well, what should I do? You're allowed to answer but you're not allowed to pester them. " Surprise visits from school - Fruitman says, "Definitely a nay! Definitely a nay! It is very hard. Parents visiting us in the first place is something tricky to deal with because they're in our world, so we feel very responsible for showing them around, but when they show up and we have no idea they're coming and our room is a mess." Prying for details – Potash says, "The best way for a parent to handle it is: tell me something interesting that happened to you this week. The kid is going to tell you that something he or she wants to share, but you're not saying, 'So what grade did you get on that paper you wrote?'" Prearranged phone calls – Fruitman says it is a good idea. She notes, "Not necessarily down to the minute, but it's helpful to know what time is good." A lot of college students are free at night when parents are not necessarily awake, so if we know there is a time of the day that our parents are going to be home and it's helpful to talk to them, I think it is a good idea." Care packages - Always send care packages that contain food or money. "Indeed, yes! Lots of food, lots of money! We are big fans," Fruitman says. Phone cards and communicating by the computer are terrific ways to stay in touch, as well. Potash notes, "Lots of colleges have Web sites where parents can learn about what is going on in their child's school and it's a good way to connect with your kid without invading their life."